2 Alternative translation for "Do not go by revelation;..."
5 "There is no wealth like knowledge, and no poverty like ignorance." Alternative translation for "Do not go by revelation;..."
This is a much more readable translation, but as i cannot read the original i just put it here, maybe someone who can could decide whether it's accurate enough to put it on the main page as an alternative translation. "The tongue like a sharp knife... Kills without drawing blood." Since the original work is obviously not in English, we need published translations. To avoid potential copyright violations in either article, we should use a public-domain translation as a source. For simplicity, I would recommend vetting all quotes against s:Dhammapada (Muller), a Wikisource article that uses the translation from a 19th-century book edited by F. Max Muller, putting it well out of copyright. It would be nice to credit contributors to this article's Dhammapada section with their contributions at Talk:Dhammapada. However, I don't believe it's necessary by our license requirements, because those contributions remain available through both articles' edit histories. Just be sure to include an edit summary that makes clear the material was transferred from this article. 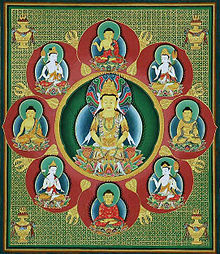 As per the discussion above, I moved the Dhammapada section in Gautama Buddha to its own wikiquote article, Dhammapada. I tried to maintain the original quotations as much as possible, but, due to copyright concerns (explained above), I had to significantly change much of the original material to conform to publically available sources. "There is no wealth like knowledge, and no poverty like ignorance." I'm pretty sure Ali said that... and I agree. Can Someone source why they're applying this as to Buddha? The no-mind not-thinks no thoughts about no things. There are two mistakes one can make along the road to truth - not going all the way, and not starting. When a man has pity on all living creatures then only is he noble. These quotes are unsourced and their authenticity as sayings of the Gautama Buddha has been questioned. Life is no more than a dewdrop balancing on the end of a blade of grass. Loose translation (“rendering”, “interpretation”) of verse 166 of the Dhammapada by Thomas Byrom, 1976. “Your work is to find out what your work should be and not to neglect it for another’s. Clearly discover your work and attend to it with all your heart.”. Don't sacrifice your own welfare for that of another, no matter how great. Realizing your own true welfare, be intent on just that. Book: The 4 nobles truths sutra. Geshe Tashi Tsering. The first turning the wheel of dharma Sutra. Let us all be thankful for this day, for we have learned a great deal; if we have not learned a great deal, then at least we learned slightly; if we did not learn slightly, then at least we did not become sick; if we did become sick, then at least we did not die. So, let us all be thankful. Desire is the cause for all your sickness and misery. Reported in Life (March 7, 1955), p. 102. Reported in unverified in his writings in Respectfully Quoted: A Dictionary of Quotations (1989). Only three things cannot be long hidden: the sun, the moon, and the truth. Dalai Lama, in Seven Years in Tibet (1997). enlightened and wearing clothing as white as snow. What is the sharpest sword? What is the deadliest poison? What is the fiercest fire? What is the darkest night?" the darkest night is ignorance. What is the greatest gain? What is the greatest loss? the best weapon is wisdom. Who is the most dangerous thief? What is the most precious treasure? Who can capture the heavens and the earth? Where is the securest treasure-trove? surpassing rebirth locates the securest treasure-trove. What is the most horrible pain? What is the greatest enjoyment? the height of bliss is redeemed awakening. but is able to enlighten the whole world. and blessings enlighten the whole world. the deva was overflowing with joy. disappeared suddenly from the presence of the Buddha. Rather than continuing to seek the truth, simply let go of your views. Buddha conquered the lands of China, Japan, entire South-east Asia, Burma, Indonesia, Java, Sumatra, Sri Lanka and other countries without sending out even one soldier; he spread the message of karuna (mercy), prema (compassion), samanata (equality) and atmasanyam ( tolerance) throughout the world many centuries before Jesus and Mohammad; even today the flame of his sandesha ( message) lights up the whole world and entire humanity with the soft glow of manavatavadi (humanitarian), vaidhnyanik (scientific) and addhatmik (spiritual) message of India. —This unsigned comment is by 66.2.70.66 (talk • contribs) . & : —This unsigned comment is by 69.219.216.130 (talk • contribs) . I think it might be better to use this (or another attributed source by a respected translator), because as it is, the current version is really unattributed, linking to a source that has a different version from the text used here, and somewhat different in meaning. Hatred does not cease by hatred, but only by love. The following quotes need additional source information, including translator, date of publication and page number. Let them show their conviction. who have reached fermentations' end. In crossing the river [from Saṃsāra to emancipation] (...) crocodiles are a designation for women. Know from the rivers in clefts and in crevices: those in small channels flow noisily, the great flow silent. Whatever’s not full makes noise. Whatever is full is quiet. Whatever precious jewel there is in the heavenly worlds, there is nothing comparable to one who is Awakened. In whom there is no sympathy for living beings: know him as an outcast. Both formerly and now, it is only suffering that I describe, and the cessation of suffering. If a man going down into a river, swollen and swiftly flowing, is carried away by the current — how can he help others across? The world is afflicted by death and decay. But the wise do not grieve, having realized the nature of the world. Resolutely train yourself to attain peace. As I am, so are these. As are these, so am I.’ Drawing the parallel to yourself, neither kill nor get others to kill. It cannot happen that a woman may become a Tathāgata, a Sammsambuddha. It is in the nature of things that joy arises in a person free from remorse. Ardently do today what must be done. Who knows? Tomorrow, death comes. Meditate … do not delay, lest you later regret it. Just as with her own life, A mother shields from hurt, Her own son, her only child,Let all-embracing thoughts For all beings be yours. Those who cling to perceptions and views wander the world offending people. Whatever living beings there may be — feeble or strong, long, stout, or of medium size, short, small, large, those seen or those unseen, those dwelling far or near, those who are born as well as those yet to be born — may all beings have happy minds. Adaptation or translation by an unspecified author. Nothing is as intractable as an untamed heart. The untamed heart is intractable. Nothing is as tractable as a tamed heart. The tamed heart is tractable. Nothing tends toward loss as does an untamed heart. The untamed heart tends towards loss. Nothing tends toward growth as does a tamed heart. The tamed heart tends towards growth. the untamed, uncontrolled unattended and unrestrained heart. tamed, controlled, attended and restrained heart. [The Blessed One] Giving food, one gives strength; Giving clothes, one gives beauty; Giving a vehicle, one gives ease; Giving a lamp, one gives sight. Women, with their two-fingered wisdom [i.e. stupid], have a difficult time [understanding what I teach]. Mara says this (Mara is a Demon in Buddhist parables), Saṃyutta Nikāya 4.
and having eaten her meal, entered the woods to meditate. Deep in the woods, she sat down under a tree. Completion cannot be reached by a woman regardless the wisdom reaped." Then Soma thought, "Who is this speaking, human or nonhuman? Surely it is evil Mara desiring to interrupt my focused meditation." which experiences insight in the light of the dharma?" The evil Mara thought, "Soma knows me"
and sorrowful for the evil, instantly vanished into darkness. In protecting oneself, others are protected; In protecting others, oneself is protected. Bamboo Acrobats An adaptation of a translation by John Ireland. replied the pupil to the bamboo-acrobat. and stood on the master's shoulders. 'Now Medakathalika, protect me well and I shall protect you. 'No, no! That won't do master! Look after yourself and I'll look after myself. come down safe from the bamboo-pole.'" "In the synthesis is the right way,"
by this the Foundation of Mindfulness is practiced. In protecting others, oneself is protected." And how does one in protecting oneself, protect others? making much of the Foundation of Mindfulness. Thus in protecting oneself, others are protected. And how does one, in protecting others, protect oneself? By loving kindness and compassion. Thus in protecting others, one protects oneself. the Foundation of Mindfulness is practiced. And this, monks, is the noble truth of the origination of dukkha: the craving that makes for further becoming — accompanied by passion & delight, relishing now here & now there — i.e., craving for sensual pleasure, craving for becoming, craving for non-becoming. May even rule the realm. Supporting oneself by fraudulent means. Know, O brahmin, that this is so. Fire is indeed produced from any wood. Is a thoroughbred restrained by a sense of shame. I prescribe purity of the four castes. not by birth is one a brahman. by deed one becomes an brahman. proclaims supreme by virtue of Dhamma and not of non-Dhamma. "There are these ten things that a person gone-forth should reflect on often. Which ten? Just as whatever great rivers there are — such as the Ganges, the Yamunā, the Aciravatī, the Sarabhū, the Mahī — on reaching the ocean, give up their former names and are classed simply as 'ocean'; in the same way, when members of the four castes — noble warriors, brahmans, merchants, & workers — go forth from home to the homeless life in this Dhamma (teachings) & Vinaya (discipline) declared by the Tathāgata, they give up their former names and clans and are classed simply as 'contemplatives, sons of the Sakyan'... This is the fourth amazing & astounding quality of this Dhamma & Vinaya because of which, as they see it again & again, the monks take great joy in this Dhamma & Vinaya. In the Way of Liberation, there is no caste. The defeated one sleeps badly. Having abandoned victory and defeat." Samyutta Nikaya, Kosala Samyutta, Battle. "Who is it that shapes our lives? Is it Iśvara, a personal creator? If Iśvara be the maker, all living things should have silently to submit to their maker's power. They would be like vessels formed by the potter's hand; and if it were so, how would it be possible to practise virtue? If the world had been made by Iśvara there should be no such thing as sorrow, or calamity, or evil; for both pure and impure deeds muse come from him. If not, there would be another cause beside him, and he would not be self-existent. Thus, thou seest, the thought of Iśvara is overthrown. "Again, it is said that the Absolute has created us. But that which is absolute cannot be a cause. All things around us come from a cause as the plant comes from the seed; but how can the Absolute be the cause of all things alike? If it pervades them, then, certainly, it does not make them. "Again, it is said that Self is the maker. But if self is the maker, why did it not make things pleasing? The causes of sorrow and joy are real and objective. How can they have been made by self? "Again, if we adopt the argument that there is no maker, our fate is such as it is, and there is no causation, what use would there be in shaping our lives and adjusting means to an end? "Therefore, we argue that all things that exist are not without cause. However, neither Iśvara, nor the absolute, nor the self, nor causeless chance, is the maker, but our deeds produce results both good and evil according to the law of causation. "Let us, then, abandon the heresy of worshipping Iśvara and of praying to him; let us no longer lose ourselves in vain speculations of profitless subtleties; let us surrender self and all selfishness, and as all things are fixed by causation, let us practise good so that good may result from our actions." 'If Whatever a person experiences - pleasant, painful, or neither pleasant nor painful is all caused by a supreme being's act of creation,'. Then in that case, a person is a killer of living beings because of a supreme being's act of creation. A person is a thief... unchaste... a liar... a divisive speaker... a harsh speaker... an idle chatterer... greedy... malicious... a holder of wrong views because of a supreme being's act of creation.' When one falls back on creation by a supreme being as being essential, monks, there is no desire, no effort [at the thought], 'This should be done. This shouldn't be done.' When one can't pin down as a truth or reality what should & shouldn't be done, one dwells bewildered & unprotected. One cannot righteously refer to oneself as a contemplative. For quotes organized by theme, Wikiquote has theme pages. On author pages, quotes are organized chronologically. There are a few exceptions, but it is my understanding that these are being phased out. Wikiquote does not use ref tags. We use inline citations. Many of the added quotes are haphazardly indented and do not follow the correct format. You seem to have pasted some quotes without attending to linefeeds. Unlike HTML, WML does attend to whitespace. Terms that may be unfamiliar to readers must be linked to Wikipedia pages that define them (e.g. Iśvara). Quotes should be sourced from written publications if possible. Do the online sources you cited refer to written sources? Are written sources available? Sources must include publication title and date. Translations must cite translator. This page was last edited on 28 March 2019, at 08:03.